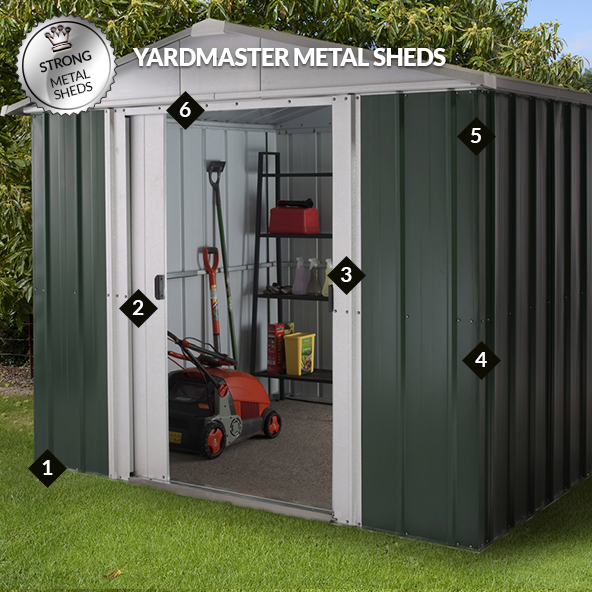 Intelligently designed, constructed in the UK from the finest materials and coming with a superb 15-year anti-rust guarantee, this superior metal shed is the perfect home for your tools, lawnmowers and garden furniture. Intelligently designed, constructed in the UK from the finest materials and coming with a superb 15-year anti-rust guarantee, the 6x7 Yardmaster Special Edition Light Green & Silver Metal Shed 67CSZ with Floor Kit is the perfect home for your tools, lawnmowers and garden furniture. Enjoying 7 layers of anti-corrosion protection and made completely from hot-dipped galvanised steel, this robust garden shed is virtually indestructible and impervious to rust. Fireproof and pest-proof too, this premium-quality metal shed will provide your prized possessions with complete protection from the elements. No treatment is required, saving you money and leaving you more time to do the things you enjoy. Furthermore, the stylish apex roof and gorgeous green and silver finish result in an absolutely breathtaking appearance. Boasting the very latest Weatherseal technology, the double doors not only offer you easy access to your shed, the fact that they are sliding means that the shed can be positioned in a relatively confined space too. Once you’re inside, you’ll find the high, ventilated roof makes for a pleasant working environment and ensures the perfect storage conditions. The doors can be secured by padlock (padlock not included) to keep your valuable items safe and secure when you’re not at home. This superior 6x7 shed has dimensions of 1890mm x 2020mm x 2170mm and comes complete with a galvanised steel floor support frame and an anchor kit. An easy-to-follow assembly manual and readily-available assistance from the UK-based manufacturer’s helpline will help you achieve a straightforward, stress-free assembly.